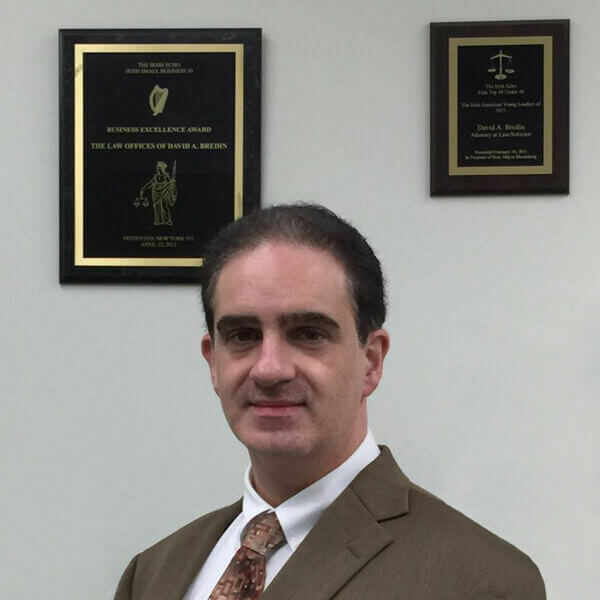 About David A. Bredin | The Law Office of David A. Bredin & Associates, P.C. Lawyer specialising in Immigration and Personal Injury, as well as other areas in the U.S. and Ireland. Hello, and thank you for taking the time to look up my office. My office is boutique in size, and I want it to stay this way, as I can show and pay special attention to each of our clients. I say my office, but everyone that I have the pleasure of working with, is truly a team, and together we look after your case and we aim to provide exceptional service. We will treat you like family, and together we will strive for a winning result in your case. I was educated and worked in the field of electronic engineering prior to my law career, but as a lawyer, in the United States, I practice and am admitted to many of the United States Appeal Courts (Federal Circuits) across the country, and also practice in front of the United States District Court - Southern District of New York. In addition to my United States legal training and experience, I am licensed/experienced internationally. I hold individual licenses in Ireland, England and Wales, and thus I can avail of lawyer/solicitor status throughout Europe and commonwealth countries. I have worked pro bono on many cases, and have been affiliated with many non-governmental organizations both in the US and in Ireland. I have also worked in New York City Court as an arbitrator. We are a private practice in nature, but if a deserving case is presented to us we shall consider such for free or low cost legal services. We normally offer this type of service to unaccompanied minors, but please feel free to contact me. For my services in law and to various communities including the Irish I was awarded a Top 40 under 40 accolade in New York in 2011, in attendance were my close friends and colleagues and his Honor Mayor Bloomberg. Our office was also listed among the top 50 Irish Businesses for 2013. If you are looking for answers, we are here for you.